It cannot be denied that if you have a reactive dog you have a completely different owner-dog relationship from the average pet-dog-owner. You have to invest time, maybe money, and much thought, into making life better for this little dog you have taken on. And in so doing you travel a road with him that most dog-owners don’t. This is why many people become devoted to their “special needs” dog, and fiercely protective of them. While this is a good thing - any deep relationship has the potential to be life-enhancing - sometimes your other family pets get elbowed out in favour of the special one, who gets the lion’s share of attention. Sometimes these feelings get mixed up with guilt - something most humans are SO good at! But really, there’s no point in blaming yourself, or the breeder, or the shelter, or another dog, or the stars … It is, as they annoyingly say, what it is. This is where we are, and blaming and guilt are not going to help you one jot! Maybe you got your dog as a puppy and something happened to upset him. Maybe you got him from rescue and the sum of his life experiences have made him reactive. Maybe your dog is just the way he is. 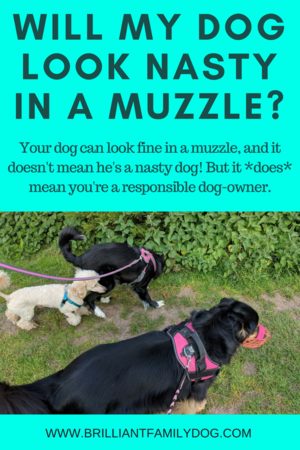 However it came about, it’s time to roll up your sleeves and get to work helping your dog. But you don’t want to forget your easy-going dogs! It would be easy to focus entirely on your neediest dog and let the other/s coast. But that would be as bad as neglecting your reactive dog and letting him get on with it. All the dogs in our care deserve equal respect and attention. But that doesn’t mean they all have to be treated the same! The joy of a multi-dog household is the contrast in characters, the differences in likes and dislikes. You find the joy for each dog and give them what they need. In my own household I have four very different dogs! And they are each treated as individuals. Rollo, the herder, gets to mind his chickens a lot of the day, usually with a large soft bear in his mouth. This harmless pastime employs his herding instincts, and keeps him happy. Lacy, the most challenging of my dogs, gets plenty of solo walks where we can work on changing her response to sudden environmental change, people who shouldn't be there, other dogs. Cricket the Whippet has her physical comforts tended to ceaselessly! She loves warmth, so she has duvets, jumpers, access to squares of sunshine . . .
Coco Poodle gets precision Obedience Competition training (a bit like dressage for horses) as this gives his fertile brain very tricky puzzles to solve, and builds his much-needed impulse control. They all get frequent free-running, exploring walks where they are free to be dogs. 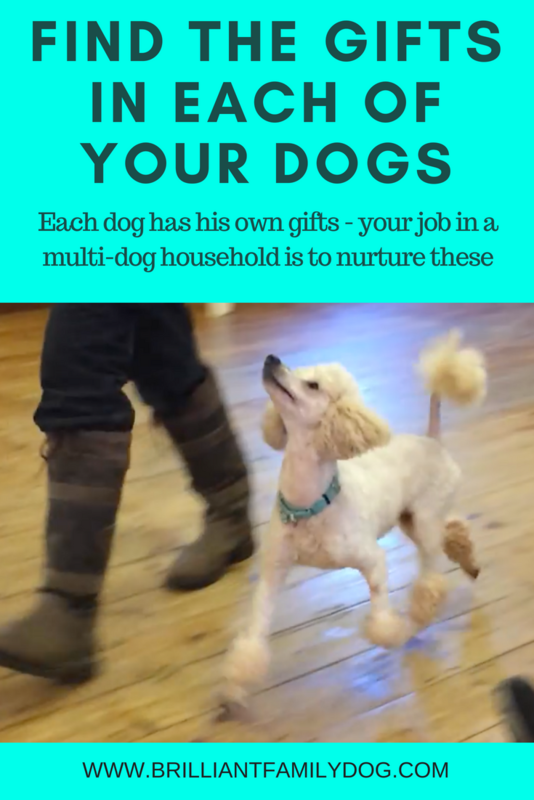 And, of course, all four dogs get similar individual training in general household obedience, and can all perform tricks for fun. Different tricks for the different characters. Each dog is ticked off for each activity as it happens. This means I never get to the end of the week and wonder when I last paid any attention to one of the quieter dogs! 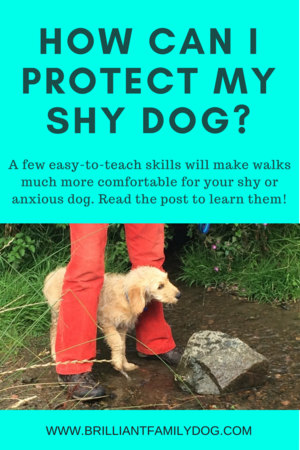 It’s easy to slip into a defensive mode when you feel people are judging you and your dog. This is a corrosive frame of mind and will not move you forward! When it comes down to it, other people’s opinions (and they are in the main uneducated opinions) count for nothing. While you don’t want to feel like Evelyn Waugh’s character “Sebastian contra mundum” (Sebastian versus the rest of the world) - and we certainly have to have consideration for our fellow-residents on this planet - this doesn’t mean we have to feel inferior, just because others don’t understand. People can be very quick to judge when they don’t understand something. Because they don’t understand, they become fearful, Hence the awful gang attacks on “different” people. Parents of challenging children have to put up with this ill-considered judgy-wudgy attitude daily, from those who have no conception of what it is like. 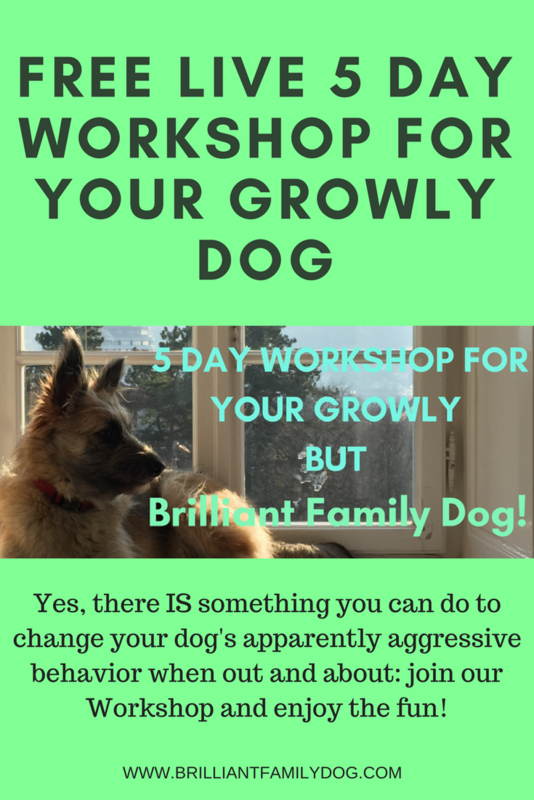 So if you have an easy dog, you can enjoy a holiday from the stresses and strains you may be feeling at the moment with your reactive and sometimes trying dog. 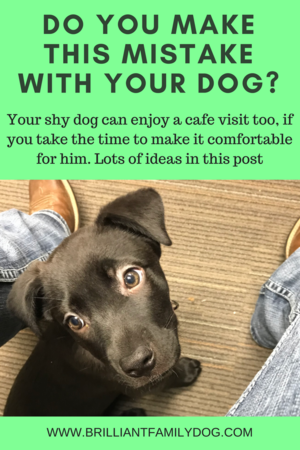 Take your easy-going, friendly, happy-go-lucky, untroublesome dog out alone with you on walks or outings - to a cafe, perhaps - where you can relax and enjoy not getting glared and stared at. Enjoy a bit of dog-therapy with her. Remember why you wanted a dog in the first place. You never know, some of those judgers may see you and realise that perhaps you aren’t such a “rubbish handler” after all. THIS MINI-COURSE IS A BONUS FOR YOU WHEN YOU SIGN UP TO RECEIVE EDUCATIONAL EMAILS AND OCCASIONAL OFFERS FROM ME. YOU CAN UNSUBSCRIBE AT ANY TIME. Success! Now check your email to confirm your place.